Waves (as we usually think of them) move through some sort of medium. If you flick the end of a jump-rope or string, a wave moves along the rope or string. Waves move through the water, or sound waves through the air, with those materials acting as the medium for the wave motion. In classical physics, waves transport energy, but not matter, from one region to another. One set of water molecules transfers its energy to the nearby water molecules, which means that the wave moves through the water, even though the actual water molecules don’t actually travel all the way from the start of the wave to the end of the wave. This is even more obvious if you were to take the end of a jump-rope and shake it, causing a wave to travel along its length. Clearly, the molecules at your end of the jump-rope aren’t traveling along it. Each group of jump-rope molecules is nudging the next group of jump-rope molecules, and the end result is the wave motion along its length. Transverse wave: A wave in which the displacement of the medium is perpendicular to the direction of travel of the wave along the medium, like the flicking of a jump-rope. Longitudinal wave: A wave that moves in the same direction in which the wave travels, like a piston pushing on a cylinder of water. 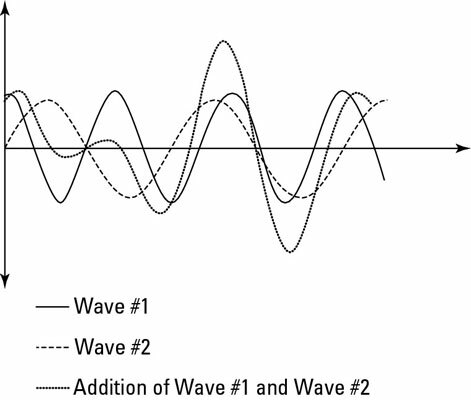 The highest point on a transverse wave (or the densest point in a longitudinal wave) is called a crest. The lowest point on a transverse wave (or the least dense point in a longitudinal wave) is called a trough. The displacement from the resting point to the crest — in other words, how high the wave gets — is called the amplitude. The distance from one crest to another (or one trough to another) is called the wavelength. These values are shown on the transverse wave. The wavelength is shown on the longitudinal wave, as well, although the amplitude is hard to show on that type of wave, so it isn’t included. Another useful thing to consider is the velocity (speed and direction) of the wave. This can be determined by its wavelength and frequency, which is a measure of how many times the wave passes a given point per second. If you know the frequency and the wavelength, you can calculate the velocity. This, in turn, allows you to calculate the energy contained within the wave. Another trait of many waves is the principle of superposition, which states that when two waves overlap, the total displacement is the sum of the individual displacements, as shown in this figure. This property is also referred to as wave interference. Consider waves when two ships cross each other’s path. The waves made by the ships cause the water to become choppier, and as the waves add height to each other, they cause massive swells. Similarly, sometimes waves can cancel each other out. If the crest of wave 1 overlaps with the trough of wave 2, they cancel each other out at that point. This sort of interference plays a key role in one of the quantum physics problems — the double slit experiment.